5. I need a bright pink dress! This one is pretty perfect. I love the shape. 4. Oh my gosh, these two swinsuits are awesome. Can you tell I'm daydreaming about warm weather? Although, we got a bunch of snow the other night and it does look really pretty. 3. 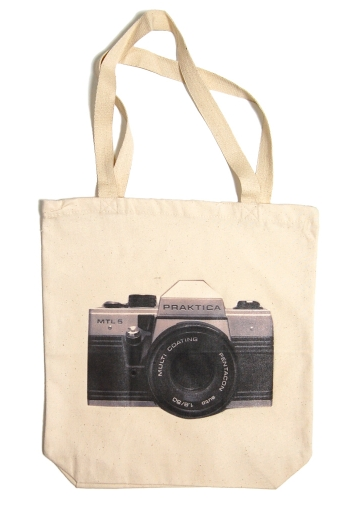 This tote bag is really cute. 2. I haven't worn a watch in years but I might make an exception for this one. 1. I am such a sucker for cute little figurines. Today I am off to get some blood work done. I don't mind it as much as I used to. When I was a kid they always had a really difficult time finding my veins and I even fainted once afterwards! Definitely not so bad now. A little off topic, but does anyone have any good recommendations for 2013 planners. I don't have one yet and I really need to change that. I need one that has a full month view calender for each month. Any suggestions? 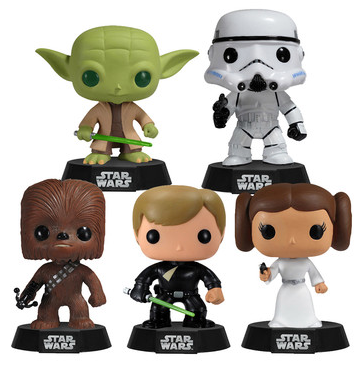 those star wars figurines = supercute! I am totally in love with those bathing suits. I must get one this summer! The Star Wars figurines are amazing as well...Must. GET. MORE. SHELVES! Oh my! I lovelovelove that dress! Good luck with getting your blood work done today! Have a great Friday! Love the bathing suits too!! I adore vintage swim wear, I was looking around for a new swimsuit and I happened upon this site: http://www.popinaswimwear.com/ some way cute stuff on there. I use the planner made by Frankie Magazine (based out of Australia!). The shipping is a little more than normal but its the best planner I've ever had and I just reordered my 2013 one! The seasons are backwards which makes me giggle. That watch is too cute! Good luck getting your blood work done. Needles still make me squirm. Oh my gosh. Those bathing suits!!!! I am definitely on the hunt for a cute one like those this for the summer. Aaaaaaaand..... I fainted once after giving blood too. ick! I'm still looking for a planner too. Let us know what you choose! Totallyyyyy love the swimsuits! I have been keeping my eye out for some cute swimsuits for summer too, even though it's not even january yet haha! And I've been looking for a planner too! I might scour the comments for suggestions too! I've been looking for a tote bag. this one is perfect! Thanks for sharing! Have you ever seen Korean planners? They are super cute and amazingly organized. I used them for years before I finally gave in and went digital. I had to pay through the nose for them on eBay but now lots of online shops sell them. Here are some examples: http://k-styleme.com/office-and-stationery/planners-journals.html but you can find them other places too. I just got a myagenda desktop planner from momagenda and it's amazing! The best part is that you can get it in metallic purple. Gorgeous! Those swimsuits! I would wear one of those :) thanks for sharing! I'm terrified of getting blood work done. But I'm scared of any doctor appointments, even getting my eyes examined scare me. -.- I'm such a cry baby. I bought my monthly calendar planner from the dollar store last year. I love the full-month view. It's plain and basic but it works and you can't beat the price! Plus, you could jazz it up with your own stickers and doodles. I purchased this adorable planner & journal from ModCloth not too long ago... it's The Little Prince themed and is absolutely adorable and beautiful. Comes with a small desk calendar, and has small overviews and big page-sized views of the days. I'm assuming the larger viewed ones are more for journaling, but I will probably use it just for events, since I am so busy. I also love that it's a nice hard cover, since so many of my planners get ruined and pages get ripped out with soft covers! Happy New Year, and I so enjoy your blog! About the planners I looked for some free over the internet, and you have some choice. But the agenda that Mima showed it's really awesome! I bought my agenda here http://www.facebook.com/closetviana?fref=ts with the sentence "Some people dance in the rain some people just get wet"
It's from an artist collective!